The classic simplicity and functionality of Roller Shades have made them the preferred choice in residential and commercial settings. The range of fabric, control systems, custom accents, valance and hem options allow roller shades to be adapted to fit in any environment. 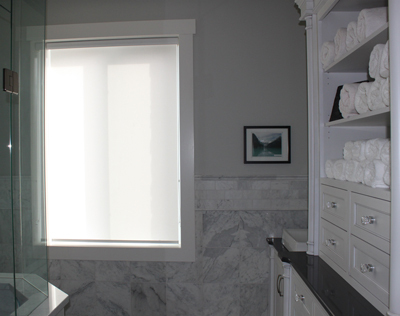 Designer Shades are beautiful window treatments whose operation can be controlled by a chain clutch, cordless option, or a motorized system that allows you to easily raise and lower the shade. We offer Designer Shades in a wide array of prints, patterns, colours and textures, in a variety of materials including vinyl, suede, and polyester. Transparency values are available in 1%, 3%, 5%, 7%, 10%, 14%, 25% and room darkening. Motorization Discover the advantages of motorization and how it can increase the efficiency of your home. Photo Gallery Visit our photo gallery to see a sample of other residential projects. Using environmentally-friendly fabrics can contribute significantly to obtaining points for LEED and other green-building rating systems. These fabrics promote outstanding heat rejection during summer months and provide insulating properties in the winter. Fabrics are formaldehyde and PVC-free, and are Green Guard Certified, containing no harmful health elements and with low VOC emissions.